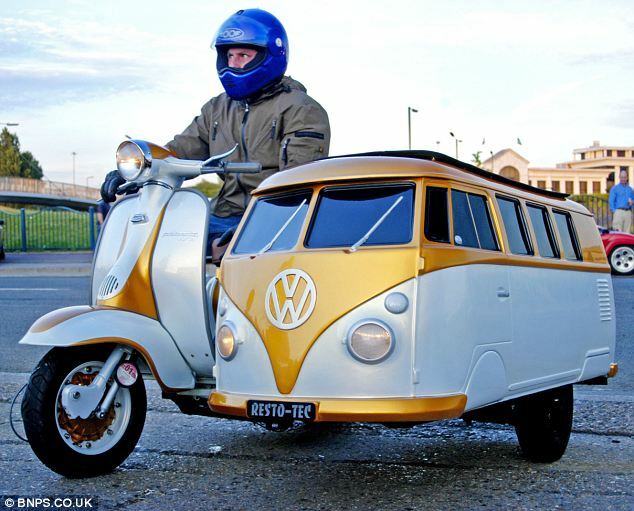 One scooter enthusiast's boy can boast the hippest ride after his dad pimped his sidecar to look like a classic Volkswagen Camper. The custom-built accessory was created by Jay Dyer, 44, for his 11-year-old son Kaine to sit in while they drive around the country. After buying the 'skin' in Belgium, Mr Dwyer spent seven months welding and painting the one-of-a-kind modification in his back garden. He then had to make sure the lights on the camper van worked before fitting it to the 1961 Lambretta. Now the father of two, from Northwood, Middlesex, is continually stopped while driving by people desperate to have their photo taken with it. He said: 'When my son and I are driving along the roads we turn everyone’s heads. 'We get absolutely mobbed by people when we take it to shows and journeys can take ages because we’re constantly stopped for photos. 'No-one has ever seen anything like it and it’s a great feeling to see the look on people’s faces once they realise it’s a miniature camper van. 'I’ve had scooters for 27 years and see them as an iconic part of British culture, I’m glad to make my contribution.